It’s time for our WEEK IN REVERSE where we take a look back at what the Confetti Crew was up to this week. The entire Crew participated in the Pretty Packaging hop on Monday. If you haven’t had a chance to go through the hop, check out the Pinterest board we created with all the Confetti Crew inspiration HERE. 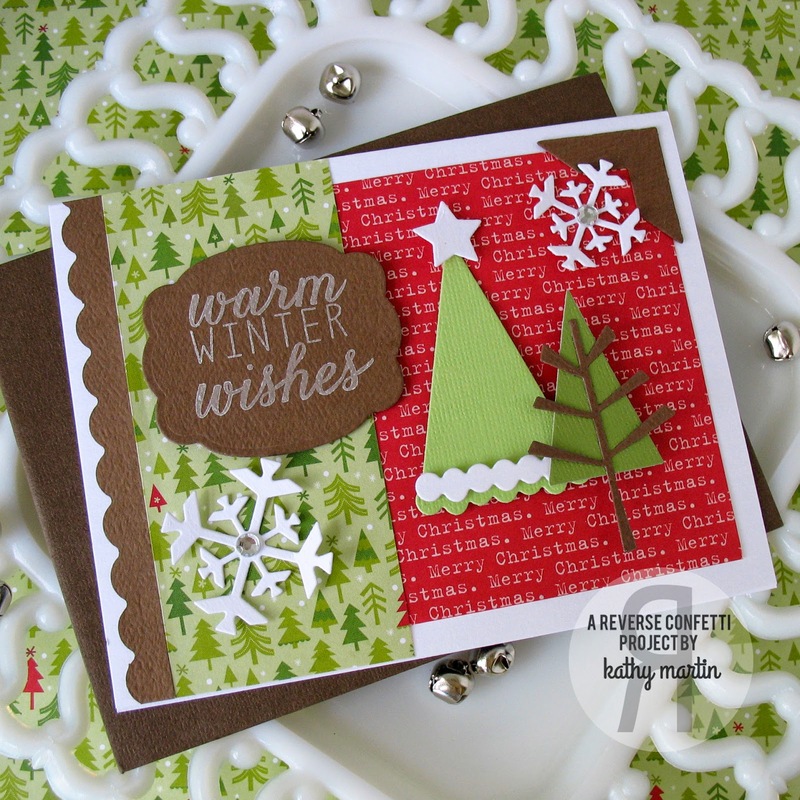 How clever of Leigh to create ornaments from the leaves of the Fresh ‘n Fruity Confetti Cuts die set! Thank you all for the love over the past week with all your sweet comments!! I love that you are so excited about this release…I am, too! The FOUR new stamp sets and SEVEN Confetti Cuts die sets are available in the the Reverse Confetti store now. I have a lot to share with you today, as I just couldn’t put these new sets and dies down! My first project today features the new DONUT YOU KNOW stamp set and DONUT YOU KNOW Confetti Cuts die set. Can I just say that I LOVE that donuts are trending!!? My second project today features the new NORTH POLE WISHES stamps and NORTH POLE WISHES Confetti Cuts on a bag cut with the TAGGED TOTE Confetti Cuts die set. This was such a fun and easy project to make. I can’t wait to make a few more for Christmas packaging…perfect for gift cards and small sweet treats! Scalloped border cut from the DOUBLE EDGE SCALLOP BORDER Confetti Cuts die. One more project before I send you on your way to see all of the fun projects put together by the Confetti Crew and ‘Fetti Friend! This last project features a tag cut from the (previously released) TAG ME, TOO Confetti Cuts die set and embellised with a sentiment from the new SEASONAL SENTIMENTS stamp set and a layered tree cut from the new BRANCH OUT Confetti Cuts die set. As you will recall from yesterday’s post, I was having a lot of fun with gold cardstock and I kept that going on this tag by using it with the trunk/branches of the tree. It’s the perfect bling-y detail for this tag! The black and white striped ribbon is tied off with double bows of red and green linen thread to match the tree and heart. Hello ‘Fetti Fans and Merry Halloween Eve…or as I’ve seen it called Elsaween. Just how many Elsa costumes will we be seeing tomorrow? I’m glad that my kids did not go the Frozen route (I’m Frozened out!) and will be dressing up as a pirate and a vampire. Yes, my 4 year old is going to be a vampire…”with bloooood,” as he says. Needless to say, it should be interesting. Let’s see if I can remember to take pictures! Hi everyone, Amy here today for this week’s Confetti Camera installment. Today, I’ve created a gift for a very dear friend who is undergoing chemo treatments for breast cancer. She is nearing the end of her eighteen treatments, and I thought I’d give her a way to count down the very last of these treatments and get to the finish line. The outer packaging is a matchbook-style wrap, with the bound side held together with a binder clip. For the front label, I used the ENVIE WRAP Confetti Cuts die, topped with a circle from CIRCLES ‘N SCALLOPS Confetti Cuts. The sentiment is made up of the word “count” from COUNT YOUR BLESSINGS, plus the word “chemo” and “down,” which were done by combining individual letters in the same font from a whole bunch of different sets. I added in some die-cuts for extra design elements: DOUBLE EDGE SCALLOP BORDER Confetti Cuts, PRETTY PANELS: TRIANGLES Confetti Cuts , and BEAUTIFUL BANNERS Confetti Cuts. On the inside are three tiny paper gift sacks, one for each chemo treatment that’s left. The outsides of the each bag are numbered, and the inside has a motivational tag (plus a Ghirardelli chocolate square). The #3 bag features the PRETTY PANELS: DIAGONAL STRIPE Confetti Cuts , ARROW Confetti Cuts and LOVE NOTE Confetti Cuts. The tag inside has a motivational sentiment from ALL ABOUT YOU. 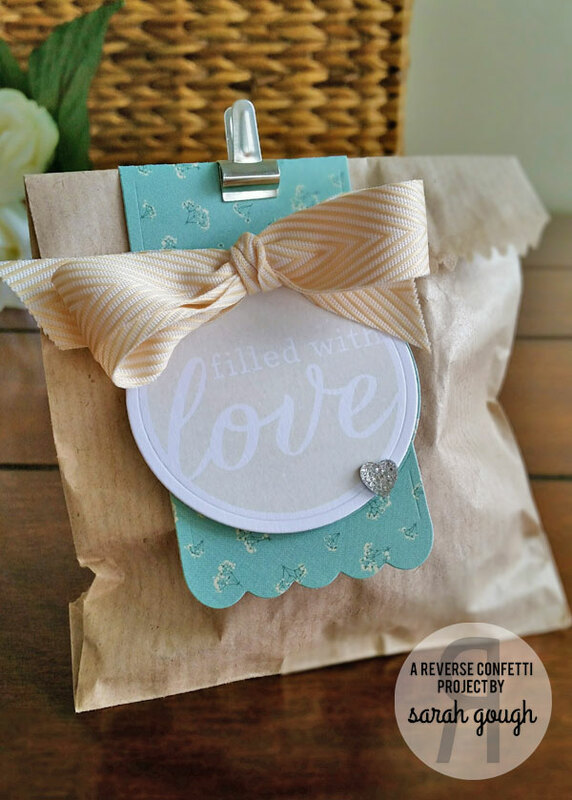 The #2 bag features the PRETTY PANELS: CHEVRON Confetti Cuts and TAG ME Confetti Cuts. The sentiment on the inside tag was cut on my Silhouette. The #1 bag features the PRETTY PANELS: TRIANGLES Confetti Cuts , OH MY STARS Confetti Cuts, and TAG ME Confetti Cuts. The tag inside uses the PRETTY PANELS: TRIANGLES Confetti Cuts again, as well as a sentiment from WINNING and a star accent from OH MY STARS Confetti Cuts. This same idea could easily be repurposed for any type of countdown, or simply used as a mini-album for photos, a collection of favorite quotes, funny kid sayings, even a collection of gift cards for a teacher or coach. Ever have on of those weeks? Yep, it’s been one of those. I realized yesterday that I haven’t had a chance to create anything and today, I am setting aside some time to do just that. I have a feeling my perspective on things might just be a little sunnier after that happens (and during, too). What have you been up to creatively this week? Have you had a chance to play along in this month’s SKETCH FOR YOU TO TRY? If not, check it out HERE and play along for a fun chance to win. Being that it is Friday, it is time for our WEEK IN REVERSE where we take a peek back at what the Confetti Crew has been up to lately. FABULOUS FLAMINGO and the coordinating FABULOUS FLAMINGO Confetti Cuts are BACK IN STOCK! Today we have a bunch more inspiration using this fun color palette! Thanks to everyone that hopped with us! The comment winner was taken from right here on the Reverse Confetti blog. Amber, please email info@reverseconfetti.com to claim your prize! Being that it is Tuesday, it is TIME FOR A CARD TUESDAY! 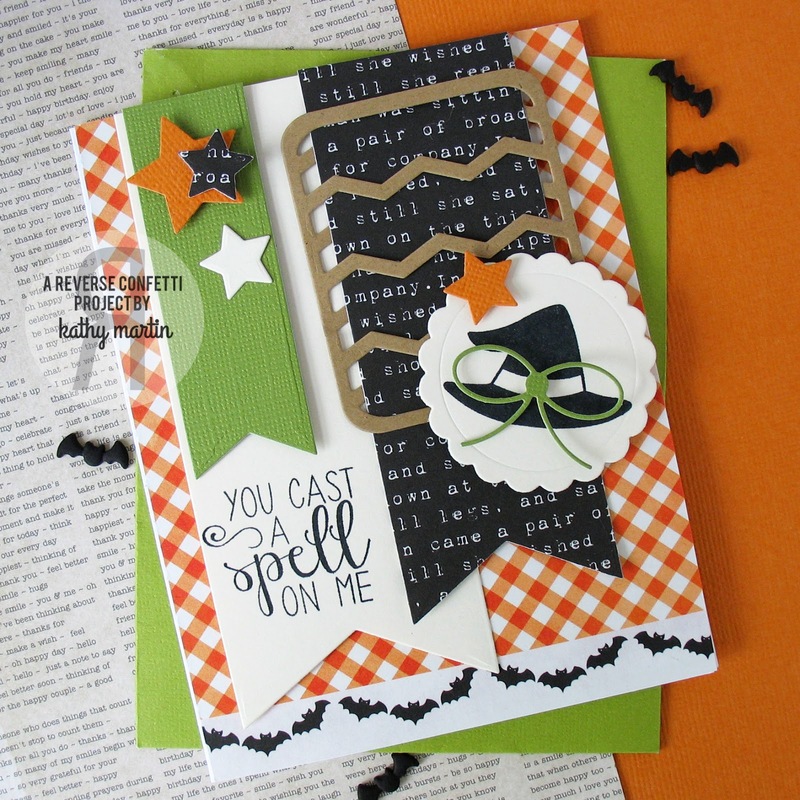 When I sat down to create this card, I had new I wanted to create a scrappy card. I dug through my Confetti Cuts dies and grabbed a few that I wanted to work with. I originally had 2 large hearts where the flowers are, but then switched over to the flowers when I grabbed this set for a sentiment. There’s a pink polka dot flower under the pink solid flower. I smeared the ink from the dots in the center and took “the opportunity to embellish” with the larger solid flower I had already stamped and cut sitting on my desk. The flowers are stamped from the PETALS ‘N POSIES stamp set and the PETALS ‘N POSIES Confetti Cuts die set. The leaves are cut from the FRESH ‘N FRUITY Confetti Cuts die set. Under the flowers, I cut a panel from the CHEVRON PRETTY PANELS Confetti Cuts die set in white and layered it over a light gray panel. 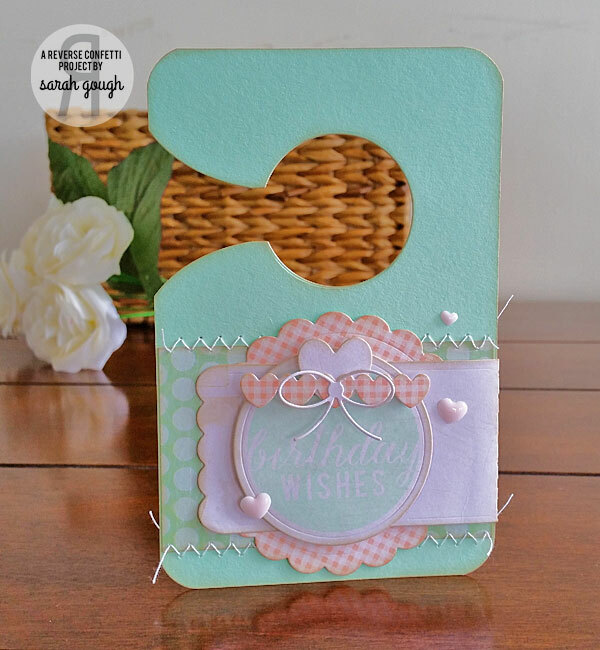 The fun and chunky notebook paper panel is cut from the OFFICE EDGES Confetti Cuts die set. Poppin’ this one into my stash…and I just might make a few more just like it! Monday is my day to make my weekly to-do list and catch up on any reminder type stuff. So, it’s fitting that we have a little bit of a reminder post today. Reminder #1: HOP! If you haven’t hopped yet, keep scrolling past this post to our August Creative Hop. 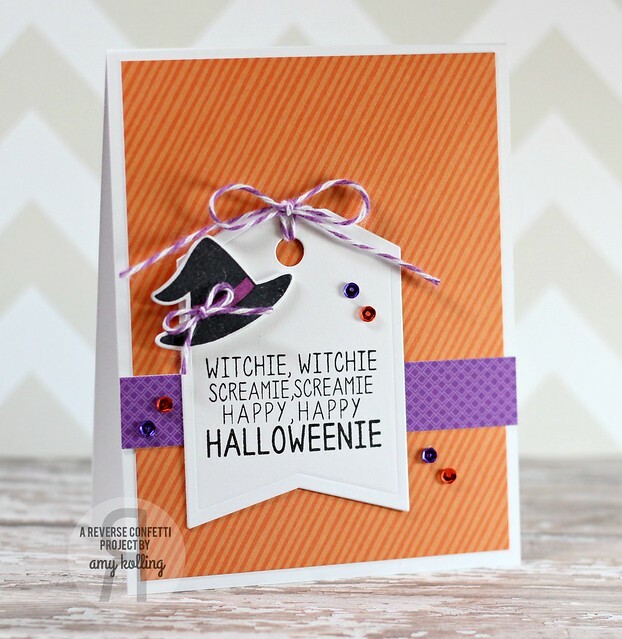 There’s lots of fun and inspiring creations, as well as a chance to win! Reminder #2: CREATE! Our August Sketch For You to Try is coming to a close soon. We have a lot more inspiration to share with you today. Come play along for another chance to win! 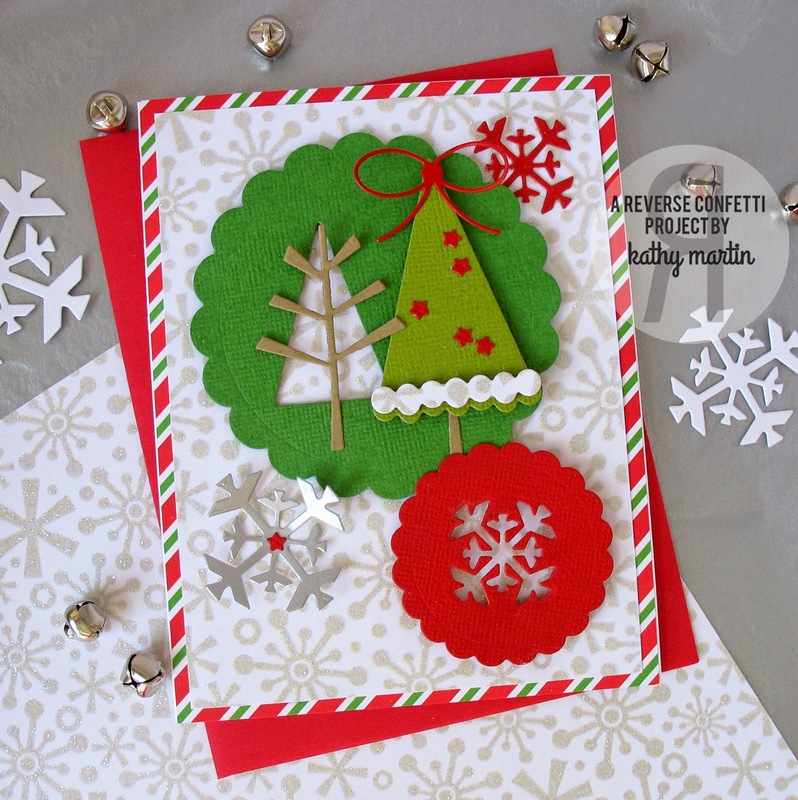 Today, I’m focusing on another fun and different way to use your Reverse Confetti Confetti Cuts dies…as stencils! So, I think that I have said it before, but I will say it again…I am not a technique person. The thought of the mess and the time and the mess is enough to send me over the edge. I mentioned the mess, right? So, when we got to chatting about embossing paste over this past weekend, you would think that I would check out of the conversation. Nope. I was actually intrigued. I’ve seen lots of samples and loved them, so when we got to talking about how easy it was…and not all that messy…I thought that this was something that I could get into. So, off I went and purchased a couple different embossing pastes. I got some stencils, too, but I decided to make my own for today’s project. Yes…make my own. Easy peasy. I cut out the CHEVRON PRETTY PANELS Confetti Cuts die from heavyweight vellum. Then, I placed it on a piece of pattern paper and taped it down with washi tape. The heart (in felt) and scalloped rectangle are from the LOVE NOTE Confetti Cuts die set. 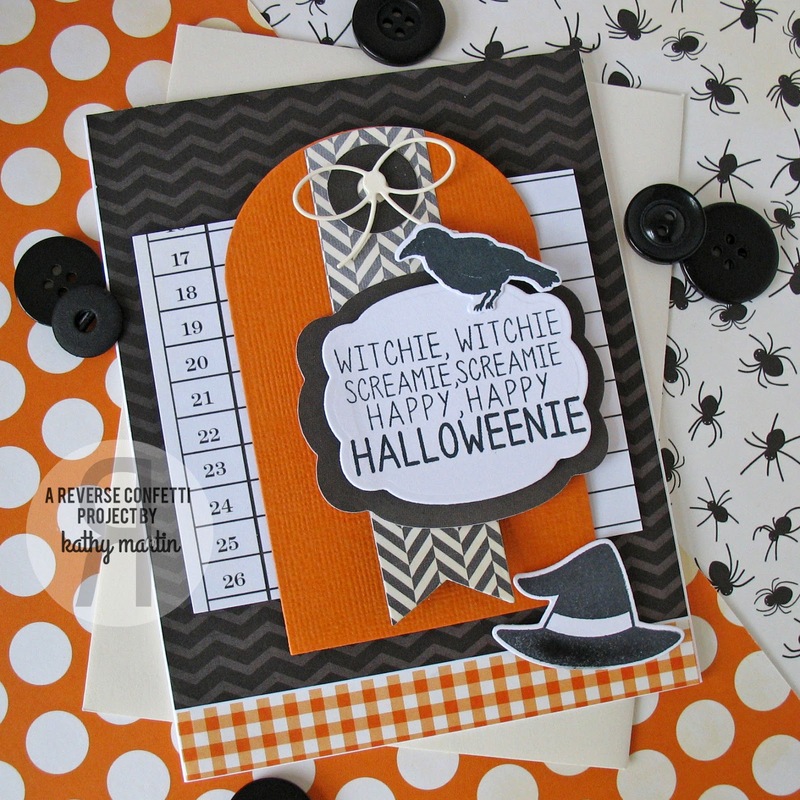 The tab cut from kraft cardstock is from the CLASS ACT Confetti Cuts die set and is stamped with a sentiment from CRUSHIN’. The flag ended panels under the heart are cut from heavyweight vellum using the TAG ME Confetti Cuts die. I wouldn’t consider myself a technique person just yet, but I will admit that I really did enjoy this, especially since it was easy to use with a homemade Reverse Confetti stencil.